A wonderful book, Seeing Red is a must read since it is both educational and hard-hitting while being readable and entertaining. Arp dismantles conventional astrophysics, based on redshift being proportional to distance, by sharing his observations on quasars, some of which are highly redshifted yet connected to low redshifted galaxies by material bridges. Writing eye-opening material in more than one arena, Arp takes on the corruption of good science in academia, government and publishing after giving us great material concerning red shift, the Big Bang, and cosmology. Seeing Red can be ordered via the link below. Three years ago, the XMM Newton orbiting x-ray telescope witnessed a galaxy ejecting two high redshift quasars. Early in the 24- hour observation of the active nucleus of NGC 3516, it recorded a flare, much like a solar flare but ten trillion times as powerful. [See link to Magnetic Reconnection TPOD (below) for Electric Universe explanation of solar flares.] Then two high redshift regions appeared on opposite sides of the galactic nucleus. One side featured a spike in redshift and the other side a similar dip in redshift--as if one spot were moving away from us and the other coming toward us at about one tenth the speed of light. The mainstream interpretation of the event is that the flare was caused by a disc of gas falling into the galaxy's central black hole. The high redshift spots are the remnants of the decaying disc. Their redshift is caused by the effect of the nearby gravitational field of the black hole tugging on the light and reducing its energy. The redshift spike and dip are caused by the orbital velocity of the disc around the black hole, one side rotating toward us, reducing the redshift, and the other side rotating away from us, increasing the redshift. Is there any way to distinguish between the two interpretations? Actually, there's a simple way. The press release says the researcher "suspects that the highlighted gas fell into the unforgiving black hole just a few days after the measurements." So if we were to point a telescope at NGC 3516 today, we should see nothing left of the event. But if the event was a quasar ejection, the quasars should still be there, moving away from the galaxy core, growing brighter. The trouble is that accepted theory already knows how to explain away bright pairs (or more) of quasars seen across a galaxy nucleus. These they call gravitational lensing of one distant quasar. 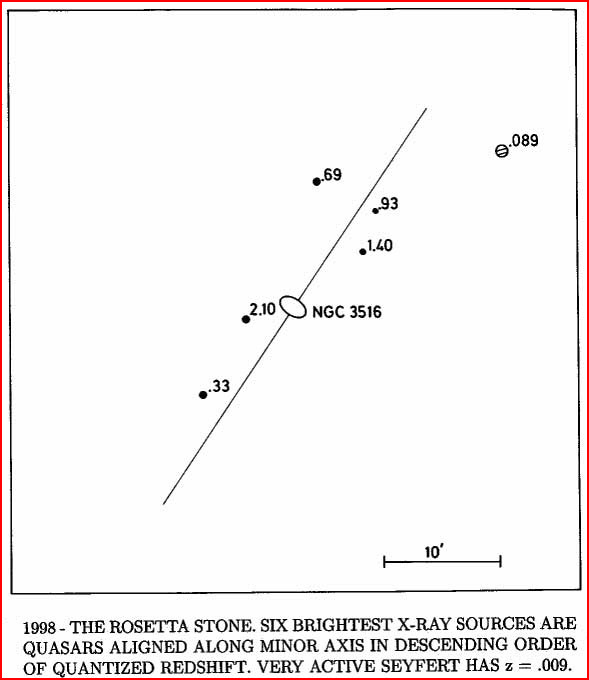 This isn't the first time NGC 3516 has been a player in the redshift controversy. (see above diagram from Halton Arp's book, _Seeing Red_). There are six high-redshift objects distributed in a non-random manner along the spin axis of this galaxy. (The galaxy is the oval shape in the middle of the diagram, and the direction of the galaxy's spin axis is indicated by the diagonal line.) The galaxy's redshift is very low: z=.009 (meaning that its light is shifted toward the red by the fraction .009 of its wavelength). The objects' redshifts are called out on the diagram. When Arp began writing _Seeing Red_, there was only one discordant object in this field, the striped ball at the top of the picture, marked by its redshift of 0.89. This is a BL Lac object, a very rare type of quasar. Arp had been examining the regions around the twenty-six brightest Seyfert galaxies (galaxies that are "active" with star formation, etc.). He discovered that five of the brightest BL Lac objects are less than one degree away from one or another of these 26 bright Seyferts, including this BL Lac-Seyfert pair. Since both of these types of objects are rare (especially being the brightest members of their classes), the chance against these being a random association is about three million to one. As Arp finished _Seeing Red_, the Chinese astronomer, Yoaquan Chu, discovered five high-redshift quasars even closer to NGC 3516 than the BL Lac. Not only were these five quasars (plus the original BL Lac) distributed along the galaxy's spin axis, but their redshifts were ordered--the highest redshifts closest to the Seyfert galaxy. This added valuable information about how quasars evolve into normal low-redshift galaxies. For that, Arp called this the Rosetta Stone of intrinsic redshift. How appropriate that it was the same galaxy that is now caught in the act of ejecting a new pair of quasars.